I’ve long held that dessert is the most essential and anticipated part of any meal, especially during the holidays. So why not create an entire party that’s devoted only to desserts? Sure, this is a slightly radical idea, but the way I see it, a dessert party is the ultimate holiday event: unexpected, festive, and ever-so-slightly decadent. A desserts-only bash is also an amazingly carefree way to entertain, because everything can be made ahead. With just a few finishing touches before your guests arrive, you’ll be party-ready. Make and freeze the biscotti. Make and freeze the cheesecakes. Bake (but don’t fill) the carmel thumbprint cookies and freeze. Make and freeze the pan of Kahlúa triangles (but don’t cut into triangles). 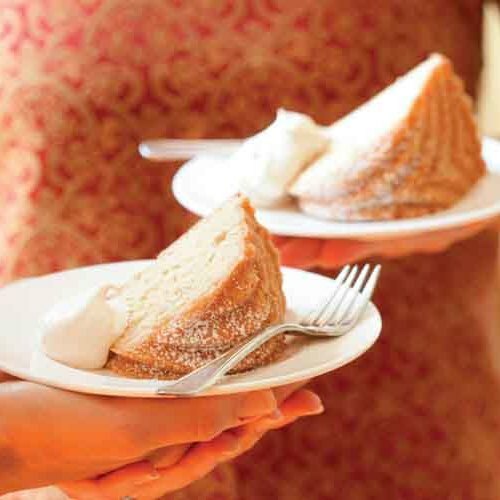 Make the pound cake but don’t dust with sugar; store at room temperature. 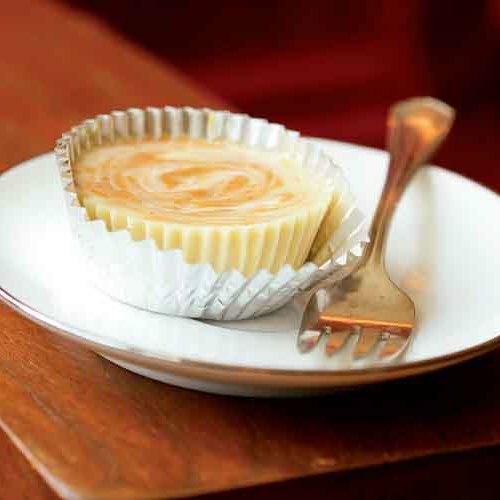 Remove the mini cheesecakes and the Kahlúa triangles from the freezer and thaw, still wrapped, in the refrigerator. 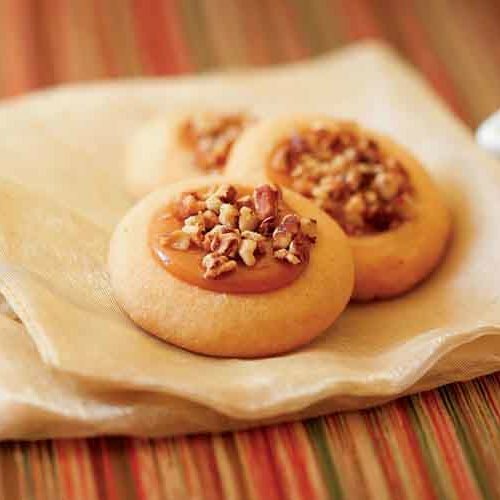 Make the caramel filling for the thumbprint cookies and fill them; store at room temperature. Cut the Kahlúa truffles into triangles, arrange on a rimmed sheet pan in a single layer, cover the pan with plastic, and refrigerate. Remove the biscotti straws from the freezer and thaw, in the container, at room temperature. Select the serving plates and utensils for the desserts, along with linens, candles, and other table decorations, and set the table. Put the pound cake on a serving plate, cover loosely with plastic wrap, and set on the table. 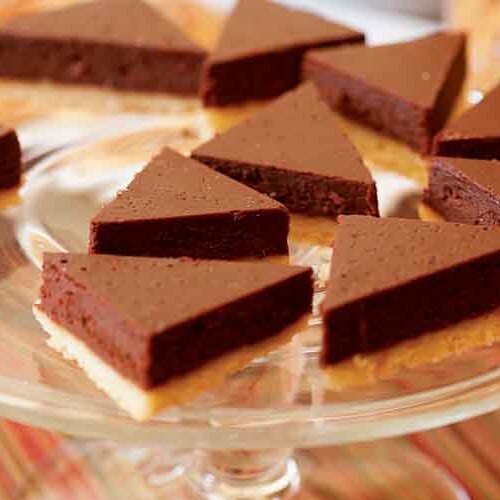 Arrange the Kahlúa triangles and mini cheesecakes on platters or plates, cover loosely with plastic, and refrigerate. 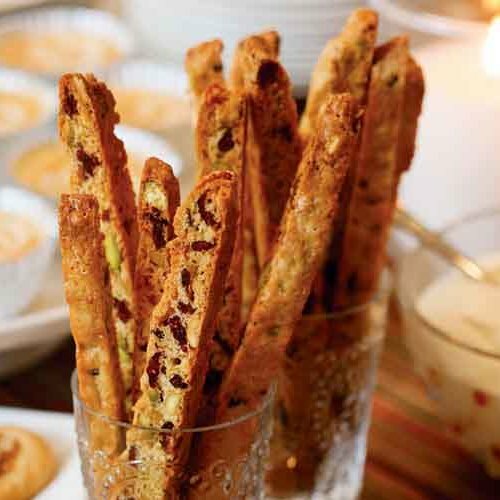 Taste the biscotti straws and, if you like, refresh their flavor by baking them on a cookie sheet at 350°F for 5 minutes; arrange the biscotti in a tall glass or on a platter and set on the table. 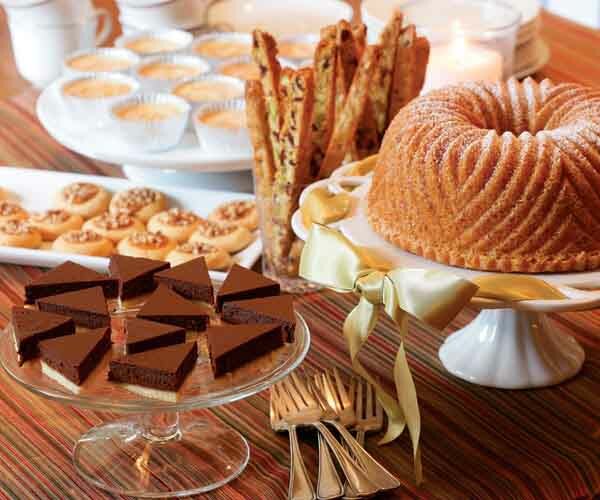 Make sure you’ve left room on the table for all of the desserts; some will stay in the fridge until the last minute. Arrange the thumbprint cookies on a plate or platter, cover loosely with plastic, and set out on the table. Make the brown sugar whipped cream, spoon into a serving dish, and refrigerate. Remove plastic wrap from desserts on the table. Dust the pound cake with sugar. Remove the whipped cream, Kahlúa triangles, and cheesecakes from the fridge and put them on the table. Coffee liqueurs like Kahlúa always taste good with chocolate or coffee-chocolate desserts. Enjoy the liqueurs in French- or Italian-roast coffee topped with fresh whipped cream, or straightup in a liqueur glass. Fruit-based liqueurs like the legendary French raspberry liqueur Chambord work well with any dessert that has a fruit element. Serve fruit-based liqueurs chilled without ice in a liqueur glass, or add an ounce to a glass of sparkling wine or nonvintage Champagne.